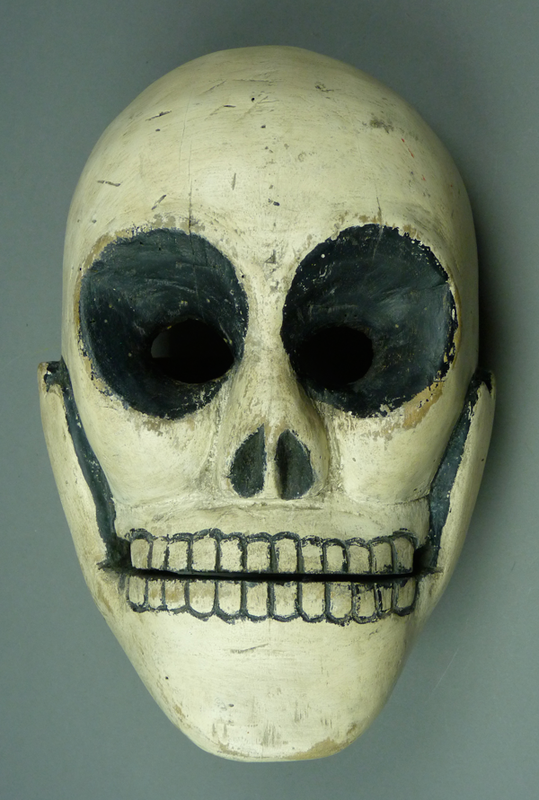 In this week’s post I will focus on Skull masks that were worn by Fariseos during Semana Santa, in San Luis Potosí. The first of these was found in Tacuarino, SLP, a place that I have as yet been unable to locate. I bought it from René Bustamante in 1993. I particularly like the hollow eye sockets. In the Mexican state of San Luis Potosí, there are dancers who are variously called los Diablos, los Judíos, or los Fariseos. These dancers may wear many many different masks—devils, other menacing or evil characters, skulls, animals, and human faces. As noted in previous posts, they imitate the persecutors of Christ. 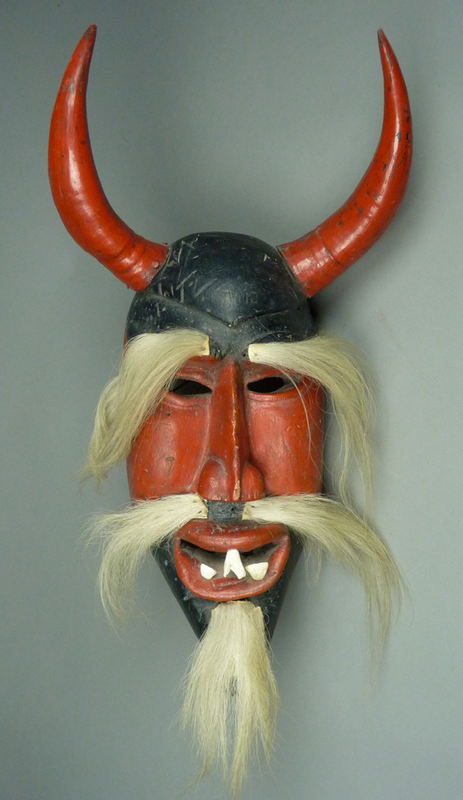 Today’s post will introduce the devil masks, along with a few that seem closely related to diablos. You can see photos of such characters and masks in action in Tancanhuitz, San Luis Potosí (circa 1960s), on pages 576 and 577 of the extraordinary book—Lo Efímero y Eterno del Arte Popular Mexicano, Tomo II or The Ephemeral and the Eternal of Mexican Folk Art, Volume 2 (there is a Spanish edition and an English edition). This is a mask of Luzbel (Lucifer), from Tancanhuitz, San Luis Potosí (SLP) that I obtained from René Bustamante in the 1990s. This mask is 18 inches tall, 8 inches wide between the tips of the horns, and 5 inches deep. In March of 2001 I made one of many visits to Jaled Muyaes and Estela Ogazon in Mexico City. I discovered that they had some masks for sale that had obsolete Mexican coins glued to their faces. Jaled told me that the money on the masks represented the thirty pieces of silver that were paid to Judas Iscariot for his betrayal of Christ. On that occasion I purchased three of these masks—a human faced mask with a droll smile, a jaguar, and a third with a primitive human face. I had initially thought that these were used in the Tlacololeros dance. 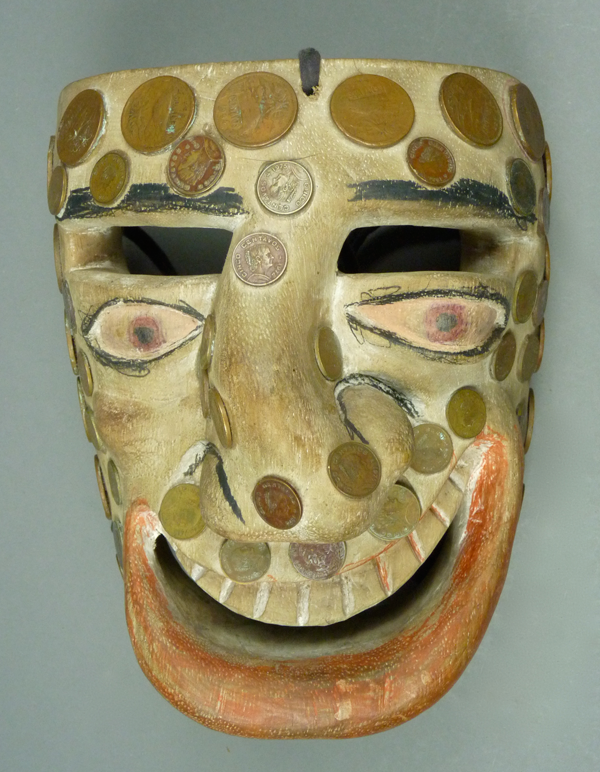 Here is the large human faced mask with the droll smile. I was particularly drawn to this mask. This mask is 9½ inches in height, 7½ inches wide, and 6 inches deep. Two weeks ago I had introduced the subject of Judas and related dancers who perform during Semana Santa (Holy Week) throughout Mexico. That post focused on the Judas dancers in Michoacán. Last week I discussed additional dancers of this type who dance as Fariseos; those masks were from Guanajuato, Jalisco, and Queretero. Next week I will introduce you to Judas masks from Guerrero that carry coins on their faces to mark their identity and in subsequent weeks I will tell you about the remarkable Judio masks used in the Mexican state of San Luis Potosí. 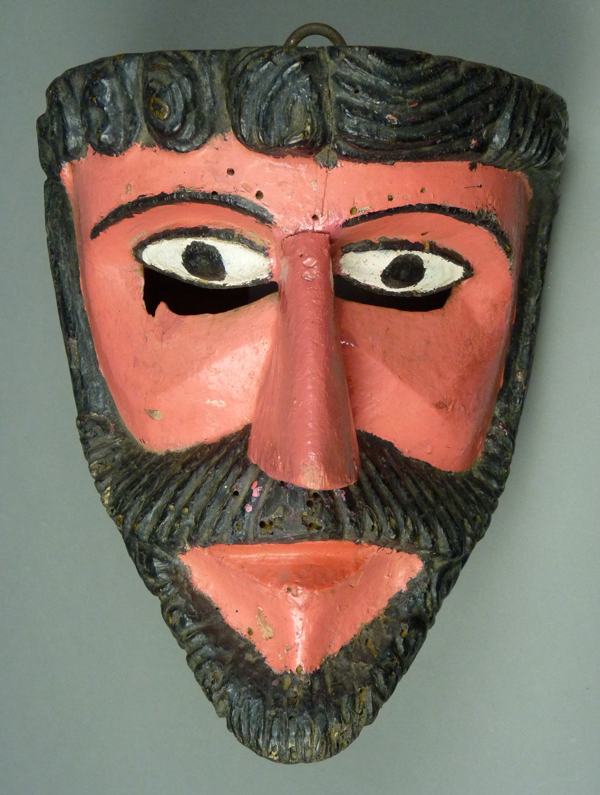 This week we will consider masks worn by Roman soldier figures during the Holy Week drama—Centurian masks from Chiapas and the State of Mexico and a Robeno (Roman) mask from the state of Hidalgo—along with hand made tin helmets worn by unmasked legionnaires in the State of Mexico and a very rare mask worn by the performer who portrays Christ. Usually the Christ impersonator does not wear a mask, but simply period clothing and a crown of thorns, but this mask from the State of Mexico even includes those thorns. I will begin with the Robeno mask from Hidalgo. Last week I showed masks associated with Holy Week in the Mexican state of Michoacán. Today I will follow up by presenting Fariseo masks from some of the other states of Mexico—Guanajuato, Jalisco, and Queretero. As I previously explained, the characters who threaten Christ in these passion plays can go by a number of different names, including Fariseos, Judios, Judas dancers, Centurions, Robenos (Romans), and Soldados. In next week’s post I will discuss Centurians, Robenos, and unmasked Roman soldiers wearing tin helmets. Several posts will follow about the Judas dancers from Guerrero and San Luis Potosí to further explore this subject. Today’s first mask is a Fariseo from the state of Jalisco. I obtained this mask from the collection of Robert Lauter in 1988. Gesso (plaster of paris) had been applied to form the hair and sideburns. In contrast, the eyes and the mustache were carved in relief. The chin was painted blue to indicate a “5 o:clock shadow,” a stylistic detail that one sees more typically in masks from the Mexican state of Chiapas and from Guatemala. 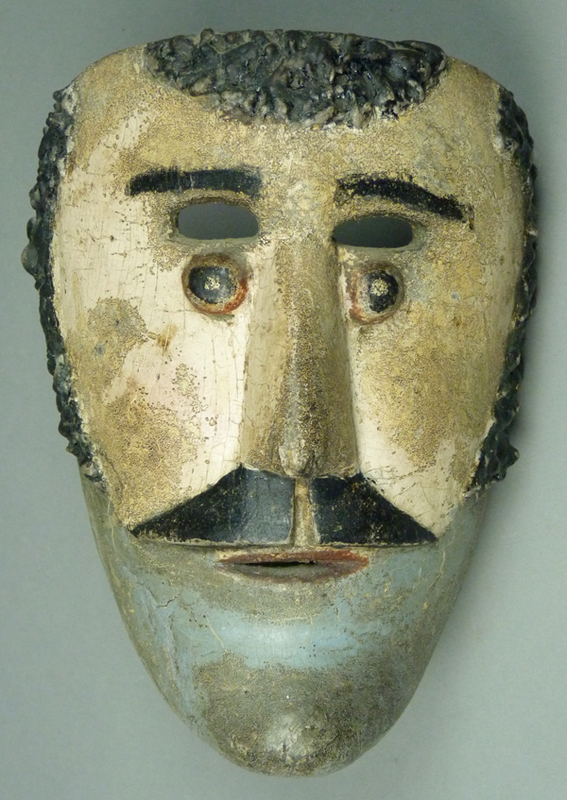 This mask has marked patina, as if it is 50 or 75 years old, but it came with no documentation about its age. This mask is 8¼ inches in height, 6¼ inches in width, and 3¾inches in depth.